Nice little pub in Brockley, on the corner of Upper Brockley Road and Ashby Road. 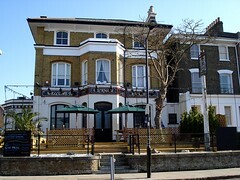 While many pub guides focus solely on the Brockley Barge (a Wetherspoons pub very close to Brockley Station) the Wickham Arms is only a short walk away and is certainly worth a visit. It was refurbished in 2007 and saw a change of management in late 2011. We haven't visited since the change of management, so our comments below may be out of date. The patio at the front has benches and sunshades for outdoor drinking, and the interior is quite cosy with old photographs and posters on the wall. Decoration is traditional and not at all pretentious, and there is a separate pool room at the back. Kake visited on a Wednesday afternoon in February 2008. I was the only customer for half an hour or so, but various locals drifted in one by one while I was there. Everyone seemed to know each other, but I didn't feel out of place. I was drinking Timothy Taylor Landlord at £2.70/pint; they also had London Pride on. I had a brief chat with the chap who opened up the pub (I think he was the manager); he said they have a pub quiz on Tuesday nights, live jazz on Thursdays, and a DJ on Fridays. He also said the pub is always fairly quiet in the day time. He hasn't got the kitchen set up for food yet but hopes to do so later in the year. Ewan paid another visit on a Tuesday evening in February 2008, and can confirm that the quiz is held on Tuesday and starts around 9:30pm. The entry charge is £1 and there are three prizes (first prize is £25, second is less, and third is a bottle of white wine). On our visit, the quiz had five rounds, but I understand the question masters change fairly often. Even in the evening on quiz night, the pub retained a cosy, quiet feel. Locals sat around the bar, and while we were there, there was an abortive and amusing drunken shouting match from one of the patrons which was quickly dealt with. In all, a very comfortable local pub to which Ewan would be happy to return. Kake popped in again on a Friday afternoon in October 2008. There were a fair few people in, and the place was a little chaotic as they were in the process of decorating for that night's Halloween party. Three real ales were on: Harveys Sussex Best, Tim Taylor Landlord (£1.45/half), and Adnams Bitter. I also noticed jars of cockles and mussels behind the bar for £1.90/jar. Accessibility: One step to get in via side entrance, lots of steps to get in via front entrance. All one level once you're in. Last visited by Kake, 31 October 2008. Last edited 2012-09-28 16:42:26 (version 13; diff). List all versions. Page last edited 2012-09-28 16:42:26 (version 13).